Click Here for an abbreviated handout to printout and keep on your refrigerator. It’s time for Advent.I love this time of year, because for our family, it really is a time that we continually look for Christ.Our whole month is scheduled with this purpose in mind. (If only the rest of our year could be that focused. )Sure, our culture is bombarding us with a materialistic message, but I have found that this just illustrates man’s deeper desire for more.It’s like the Augustine message that “our hearts are restless until they rest in Christ.”Our culture desperately needs Christ and their hearts are searching.When our family sees this Society’s desire trying to be fulfilled with more and more “things,” or the “perfect holiday meal” or the “beautifully decorated house,” it can remind us of our own need for Christ.After all, haven’t we all tried (and still do try) to fulfill our needs in other ways besides Christ? And we know that these never fulfill. A great shopping trip, a new car, a busy schedule, or even a party with friends satisfies for a while, but we soon are found wanting again.The Society that we live in is the same way.Christmas is a time when perhaps people feel this desire more.So don’t let the Culture or Society’s desperate search to fulfill this need be a distraction to you. We can let it remind us of our own desire and our need for Christ to fulfill them. Remember: There but for the grace of God go I. 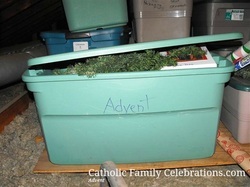 1) Follow the Church and use Advent as a preparation and penitential time. It is not the birthday party; it is the preparation for the birthday party.Follow the guidelines and examples of the church.The color for the season is purple—which means a time of repentance.It is a little like Lent.The church doesn’t ask us to fast and abstain during this time like we do in Lent, but we are to keep in mind that we are preparing for the beautiful celebration of Christ’s coming.We should prepare our hearts. Just like we don’t play the games or eat cake before the birthday party, so we should show some restraint during Advent.As much as I am able, I try to postpone as many Christmas parties as I can during this time period. (Nearly impossible when it depends on others, but I control the ones I can control. )If we are going to see “Christmas Lights”, we wait until during the 12 days of Christmas, (and they are not nearly as busy then! )We watch the Christmas specials, like Rudolph and Frosty, then.We eat our Christmas cookies and other great Christmas foods then.Have you noticed when your church puts out their Christmas decorations?Can you dare wait until a few days before Christmas to put out yours?Our new neighbors thought we were Jewish one year the weeks before Christmas because we had no Yuletide décor in our yard.In our Baptist -Southern neighborhood, I know they all just assume that the Kisers are just too busy to get those decorations out and procrastinate every year until just a few days before. Unlike Lent, during Advent our family tends to really celebrate those given feast days as ways to prepare us for Christ’s coming.We learn from these saints; we honor Mary.Some families may follow a more penitential/strict type of Advent. We control what we can control and try to use all the other Christmas activities as a means to prepare us for Christ’s coming, like if the grandparents have to show up before Christmas to deliver their gifts—what a blessing to have such generous grandparents who love us! 2) Keep it simple! Sweetheart!You know it is the time of year when we have more activities, more programs, and more on our plate, despite our plans to try to reduce these Christmas activities.This means that we just need to try to simplify in other ways.Although I have a full calendar of Advent activities (which is posted on my webpage) I still simplify my schedule by postponing dentist appointments, making easier meals, suggesting that weekly or monthly meetings skip meeting in December, and foregoing any big time chores this month (like clean the carpet, clean out the attic, etc.). 4) Plan a family confession night.And I don’t mean that we are all going to confess to each other who left the sink on in the upstairs bathroom or who left the library book out on the patio to be rained upon.I mean find a place in your schedule when you all can go to confession together.Not everyone needs to see the priest for confession. That should be up to everyone’s own discretion.But everyone needs to go to at least pray in the church. (If they don’t need confession, perhaps they should pray for us who do.) Afterwards, plan something fun together—like going out for pizza. 5) Tradition!If you want these events to happen more easily, then begin to make these happen year after year.Tradition cuts out the planning step all together.And if you store the plans and “props” of the tradition, that makes it even easier.Think about if you had never put up a Christmas tree, and you just started your first one this year.You’d put time into planning when, where, who and how.Then, you’d have to go find all the “props” to do it.You think it takes awhile now when you do it, but compare that to if you’ve never done it before.When you see my schedule it looks full, but luckily for me, I’ve done most of these activities before.I know where my books are that I read on certain days. I know where my Advent wreath is.I know how to make a piñata. I know to save the straw from my fall decorations for my manger.I have my Jesse tree and ornaments ready to hang.Some big advice: Don’t try to do it all your first year.Take your time.Add one thing new every year.Remember, your children need your presence, not your presents. Activities, crafts, baked goods, etc. can never substitute for your full presence to your children.I know I sometimes get so caught in the planning and carrying the activities out, that I forget the whole purpose behind them.Don’t let that happen to you. They are a means to a relationship with your child, not a substitute for a relationship. 6) Use an Advent bin.It took me a few years of scrambling through all of the Christmas decorations and through the house looking for what I needed for that day, before trying to simply store all my the Advent stuff together in one bin.This is extremely helpful if you don’t get your Christmas decorations out at the beginning of Advent.Shortly after Thanksgiving when I collect all of my fall decorations to store, I simply pull out my Advent bin, and I am ready to go.No more digging. 7) Get all of your Christmas shopping done before Advent begins.I know that this sounds crazy, but it will free you to concentrate on your other Advent activities.It will keep you out of the stores and malls.It will keep you off of the internet searching and searching for the best deals.It is probably too late for this Advent, but keep this in mind for the next year.Sure there are some great deals on Black Thursday and Friday, but I’ve found that I can get just as great of deals when I am keeping my eyes open in September and October.Spend your Thanksgiving weekend walking in the woods and playing football with the kids, not in the hectic mall.Throw all those shopping fliers away.Remember our children need presence, not presents.And if you don’t find them enough presents for under the tree, well, they probably are better offwithout them. 8) Final Suggestion:Only buy very thoughtful presents and only buy when necessary.I have a section in my Smart Martha’s Guide book about having fewer toys. I have many reasons spelled out there for reducing the amount of toys our kids have. Even adults need fewer toys.Do what you can to help reduce the gift buying, especially among adults.Be bold and direct if you have to, “We are trying to save up a little money this year, Sis.Let’s not buy each other Christmas presents.”I’m not saying we should be stingy.If you’ve got the means then spread the cash to your postman or babysitter or children’s teachers, but don’t just buy stuff to spread it around.Make cookies and other homemade goodies. We’ve all got too much stuff.Shopping before Advent helps us to take the time to be more thoughtful with our gifts as well as not getting caught up in the shopping frenzy that happens when we are in stores and looking through ads and buying gifts that no one really needs.